Auto Mate Systems Ltd supply and install automatic sliding gates across the UK. These provide high security from both vehicular and pedestrian intrusion 24 hours a day, when operated in conjunction with an access control system, swipe cards, intercoms or radio transmitters. They are also the most common device to secure a site by remote monitored surveillance cameras, where gates can be operated by someone in a CCTV monitoring station in another part of the country. Sliding gates are inherently secure by design as the gate acts like a section of fencing, which moves to allow vehicle access. A sliding gate does not have a natural fulcrum (as the hinges on a swing gate do), so it cannot be rammed or forced open from a frontal attack. A sliding gate is operated by drive racking (steel bar with nylon or steel teeth carved or fitted to the bar), which is driven by a motor with a matching geared cog, compatible to the teeth on the drive racking. It is imperative to choose a suitably powered motor to fit to the gate and one that allows for the number of operations that the sliding gate is expected to carry out in an hour. Remember that sliding gates are not fast moving devices, so if you have peak traffic at shift start and end times, then it is worth considering holding the gate open for short periods or having the gate either on a timer or controlled by an access control system. The selection of the motor determines the choice of racking used in the sliding gate manufacture. Nylon racking, nylon teeth fitted to a steel angle is mainly used on domestic type gates for silent running. Mod4 steel racking is used on gate motors capable of moving a gate of up to 2600Kg and Mod6 steel racking is for gates over that weight and up to 6000Kg. Auto Mate Systems Ltd. can advise you on the most suitable motor size, racking requirement and holds stocks of all sizes. 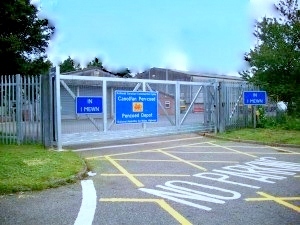 Sliding gates can be activated using many types of access control equipment, such as a digital keypad, push button, radio fobs, proximity or card swipe systems, number plate recognition, bio-metric reader, photocell or induction loop and even more recently, by mobile phone connection. When thinking about the design of a gate, it is essential that consideration is given to safety implications. At Automate Systems Ltd, we can fully advise on all aspects to ensure the best type of gate is provided to fulfil your requirements, while ensuring a high quality supply and installation. Tracked sliding gates run on a track laid into the road. The gate is fabricated with a strong beam at the bottom of the gate, into which are set two bearing wheels. These are mounted onto the rail which allows a very heavy gate to roll backwards and forwards smoothly. This provides the opportunity for the gate design to be stronger and heavier, allowing the gate spans to be up 12 metres, and heights in excess of 2.4 metres. This, when linked to the strong support frame or portals, provides a very high and secure sliding gate system. The area of clearance for a tracked sliding gate is somewhat less than that required for a cantilevered sliding gate, as the area for mounting the motor and frame may not need to exceed 1 metre. This would give a total run back area of the gate opening, plus the metre for the gate support and motor. It would be essential that the running track be flat and level. Any incline would not only cause the motor to work harder than it may have been designed for, but also the potential safety risks, should it be necessary to operate the gate manually. These are all aspects of a sliding gate that our highly qualified engineers will discuss with you when designing your tracked sliding gate system. Supply and installation of a fully operational and integrated automatic sliding gate system. A full 12 month warranty with all installations. 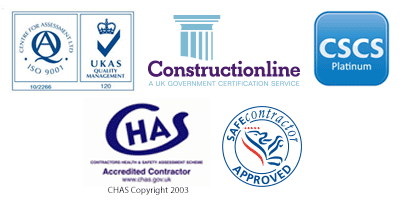 Various levels of maintenance contracts to suit your requirements (all at competitive rates). A design solution for your particular site. Diagrams and technical information on cable installations for our products. A specification of products required to help with your building design.